Raptors constitute one of the most vulnerable groups of birds because they are especially sensitive to environmental changes and human attitudes. You can support our research and campaigns to raise awareness of the importance of the environment in Armenia. Observations of their occurrence, abundance and reproductive success allow insights into habitat changes that can help to improve raptor habitat conservation in Armenia. Local villagers collect data on these birds.We hope to shift their activity from shooting birds to observing them. Awareness-raising campaigns aim at an increasing understanding of the benefits of birds of prey (for example as rodent eaters) and publicizing the negative impact of certain pesticide use on raptor reproduction. When leaving for the winter, raptors congregate in special areas called “bottleneck sites”, that are ideal spots to observe the abundance of different raptor species. Hundreds of thousands of raptors fly through these areas during fall migration – as many as 15,000 per day. 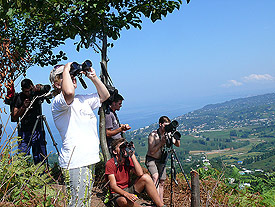 Together with international Non-Governmental Organizations, the Acopian Center for the Environment organizes yearly Raptor Count Camps at such sites (for example near Batumi, Western Georgia) involving volunteers and students from Armenia, Azerbaijan, Georgia and other countries who are trained to count and identify the raptors and who stay on site for several weeks from late August to early October. The Acopian Center for the Environment is currently working on two raptor projects; one on Peregrine Falcons and one on Long-legged Buzzards. We chose common raptor species because they are more abundant and allow for statistically significant data analysis. Also, it is easier to use these species as a model for environmental education and increasing involvement in conservation.